After a late-night entry in China, we were pleasantly surprised when the control car announced that we don't have an early start the next day. Well, we couldn't have asked for anything better. Even if not having an early start means starting the day at 8.30, we were happy with whatever we were getting. ...And we were off on our first drive in China, and what a drive it turned out to be! From the moment we started in Ruili, we were welcomed with beautiful sidewalks, smooth tarmac roads, 6 lane highways - quite a relief for the cars as well as the teams in them. During the drive to Tengchong, we crossed miles of tobacco and sunflower fields. What a beautiful sight! The pilot car led us out of the city in no time. Our first break came about 4 hours later, where we had lunch and proceeded to cover the pending 2 hours of journey. By 4, we were in the second city in China - Tengchong. To brief you about this town- Tengchong’s location on the merchant route has let it witness the rise, growth and fall of the trade in Chinese history. Once blurred on the average tourist’s maps, Tengchong has regained importance. The volcano park, which has had active volcanic eruptions in the past 500 years, the hot water springs and Beihai wetland, or marsh are quickly gaining attention as tourist attractions. Add to it the Yunfeng mountain, that resembles a bamboo shoot towering towards the sky- and you have a county that is beautified with natural features. By now, we had crossed beautiful sights, grand highways and driven at an average speed of 140kmph and were going farther away from the sea level; we were told drive to Dali will be at 6000ft. above sea level. Time for some ear-popping. Right after the cultural programme in Mandalay, we headed straight to our beds for some much-needed sleep. As the alarm buzzed after 5 hours, we knew it was time to head to the final destination - China! It's always a great feeling when you know you are reaching your destination. In this case, as cliched as it may sound, we were happy that we were approaching China but sad at the same time, because that meant our rally would come to an end. The last 7 days had been adventurous, fun, exhausting yet strangely satisfying. By then we'd already crossed 3 international borders, driven more than 1700kms, seen some unforgettable sights and met some very interesting people on the rally - from mountaineers to actors to diplomats. 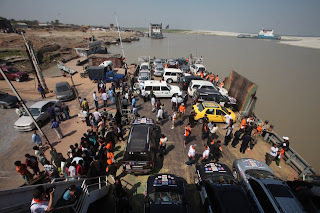 Next morning started early, as always, and the convoy made its way on clear and long roads through Myanmar towards the Ruili border, connecting Myanmar and China. The run of the day was approximately 360kms; we kept a buffer 2 hours and arrived at our destination by 7pm. By then the sun had set but there it was, the final country on the BCIM Car Rally - China. We could see neon hoardings with CHINA DUTY FREE written on it. A strange sense of achievement kicked in when we all realized we had actually driven down to China from India! But before we entered the country, we had something even bigger waiting for us- a human tunnel formed by Myanmarese to wish us luck and farewell. What an amazingly warm bunch of people they'd been! The immigration officers approached each car and handed over temporary Chinese number plates as they welcomed us to their country. Officers on duty guided the convoy into China, towards the parking and lead us to the immigration centre. 5 minutes in, we were stamped into the country. Nihao China! Ruili Administrative heads welcomed the participants and congratulated the convoy on making it through. We walked down to the dinner convention near-by, where all of us got our medical check-ups and also got instructed about the traffic rules in China. By then we knew driving in China was going to be different from the previous 3 countries. We were ready for it, ready for the last drive. 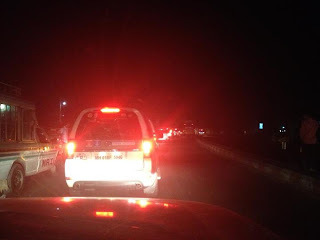 As the army's pilot car drove aside after leading us for 6 long hours, we knew we had reached the border. Our run in India had come to an end, and what a run it had been! From 500 metres ahead, we could see the border. The India - Myanmar border in Manipur is connected by a bridge, half of it in India and other half in Myanmar. 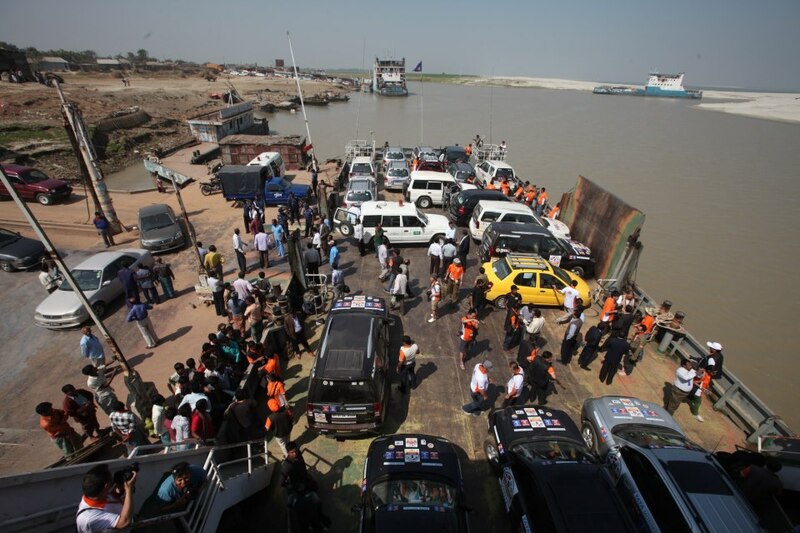 One vehicle at a time, we crossed over to Myanmar, the third country on this epic rally. 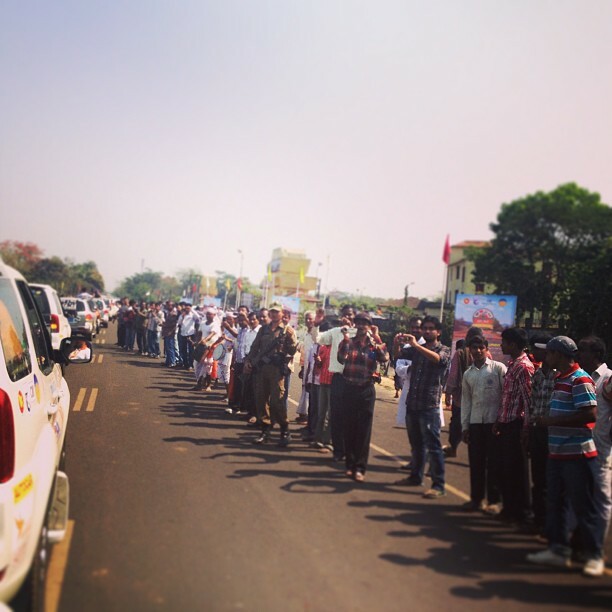 Excitement levels rose as the Myanmar team welcomed all the participants on the radio. Just a few kilometres in, we spotted beautiful pagodas. As we went along on long and straight stretches, the people of Myanmar continued to wave out to us. We were delighted to see the enthusiasm of the locals. We made our way to the town of Ka Lay later in the day; our arrival was followed by a cultural show and dinner. But before we called it a day, Htet Htet decided to sing for us. None of us could resist despite the exhaustion, and we all got on stage to shake a leg to the music. By now, we had all become accustomed to sleeping late and waking up early, and next day was no different. The night before, we were given a heads up about the rough stretch from Ka Lay to Mandalay; we, of course, thought it would be as rough as our previous off-road experience. However, it turned out to be quite a fun terrain to drive on, with straight stretches, no tarmac and hill inclines up to 45%. Quite an adrenaline rush! Half way through the stretch we came to a tea break at a small village, where the group was surrounded by local villagers. Why? One of them spotted Kaung Khant and Aye Myat Thu, the two actors from Myanmar. Well, that had been the story everywhere we went in Myanmar. Villagers were star struck. Later, we continued our drive to Mandalay, where our welcome was grand! The local administration had put together a reception with cultural performances and dinner. Just what we needed after a long day of driving! 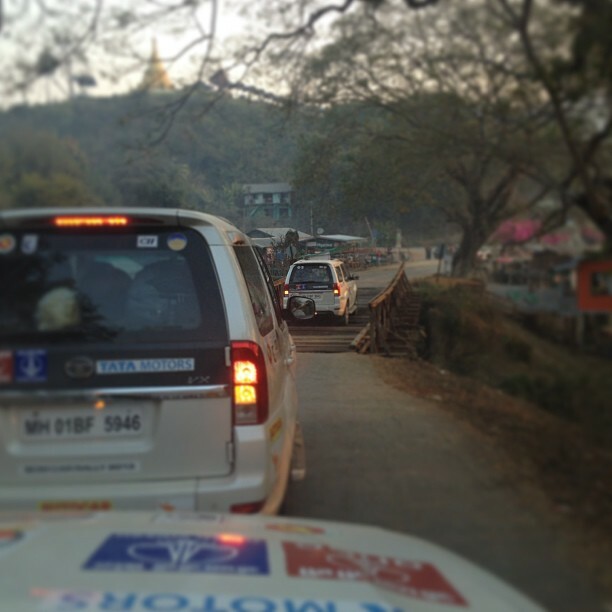 This was our second and also the last day in Myanmar, and next day was the border-crossing to China. Myanmar had kept us awestruck with its natural beauty, unmatched warmth of people and amazing food. We all knew we are going to miss the place. Our 3 days in Bangladesh have come to an end, but what that also meant was we'd be entering home, India. After an hour long drive, we reached the border. And there it was, across 'no man's land' - India. But before we could enter our home country, the Bangladeshis showed one last gesture of hospitality, dancing with the participants by the border. This was possibly the first time people from Bangladesh, China, India and Myanmar were present at the Bangladesh - India border together and dancing! Did we just notice history in the making? I believe, we did. The dance only acted as a catalyst to our already charged up mood! We could see children lined up, chanting and waving the BCIM flags. But there was something none of us could see from the other side or would have even anticipated; A heroic welcome! We hopped into our cars, slowly began accelerating towards India, waving and greeting kids on either side of the road. 100 meters in, we noticed what's referred to as a "Human Tunnel"! 4 rows of people lined up to meet us, to greet us and welcome us all. 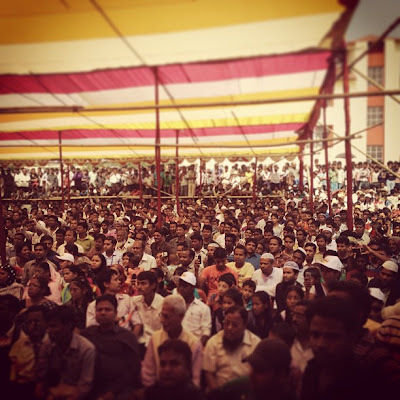 4 days in, we had seen great reception in Bangladesh however, this was something that took us all by surprise. We were then lead to the reception area, where people lined up to click photos with the participants and the cars. We made our way to the dining hall, had some lunch and moved on towards the cultural programme stage. Unlike previous cultural programmes, this was different. Why? 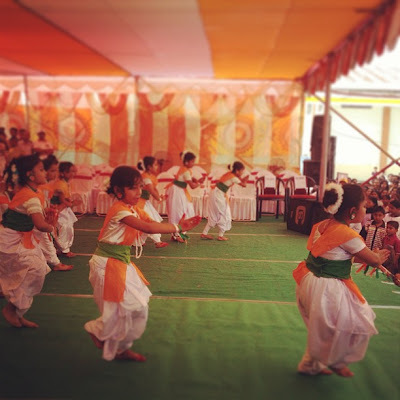 Because these kids had one dance performance on each form of Indian dance form. Our feet were already tapping, all we needed was just one call invite and all of us would have been on the stage to join the kids for the dance. Did the invite come? Yes! 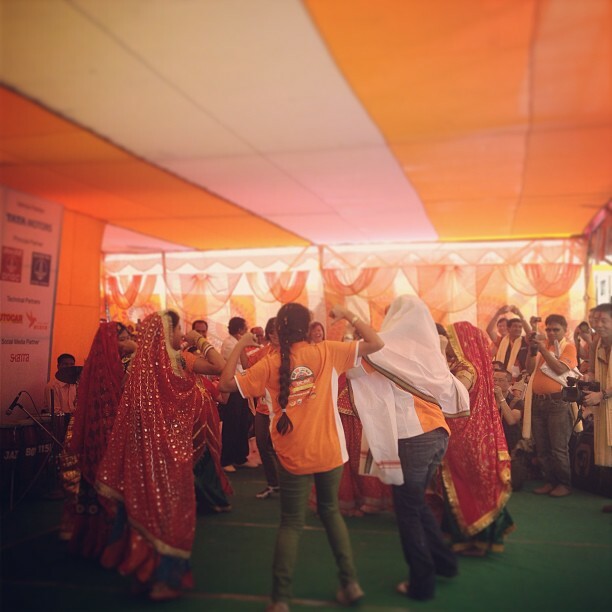 Team members from Myanmar, China and India started dancing with the Bhangra dance group, the Rajasthani group and the Maharashtrian group. We knew our stay in India will be eventful to say the least. Stay tuned for the next post. We witnessed the "real" rock and roll on our way to Imphal. But I have to say, none of realized where these 600 KMs went by, from Border crossing to hustle-bustle of Dhaka, from long deserted stretches to night driving, Bangladesh had a lot to offer! We started our day around 8.30 in the morning to head for the Indian-Bangladesh border, that’s when mixed feelings started developing. We knew we will be touching home ground in sometime but that’s when we realized our stay in Bangladesh is coming to an end. Some of us might not get to visit this country again. Starting from Car #1 till #20, everyone took their turns over the radio to extend heartfelt appreciation and gratitude to the Bangladeshi Govt., Local Authorities and of course, the very warm people of Bangladesh. Team Leader of the Bangladeshi Team extended a special invitation to each member to visit the country again. There were certain moments in the last 3 days that all of us on this rally will remember throughout our lifetime. 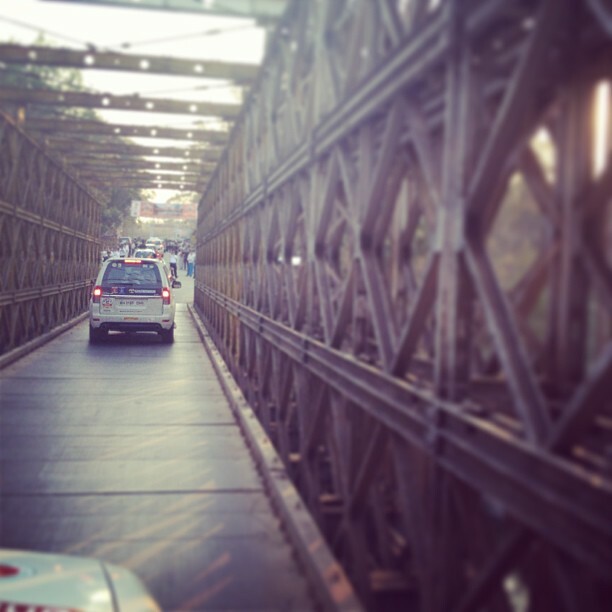 It started with crossing the border; for many of us on board, it was the first time we drove through a national border. Next one on the list has to be the visit to the National Martyr’s Memorial near Dhaka; all of us were taken aback by the history, beauty and architecture of the memorial. But, there was one incident that made everyone aboard respect Bangladesh’s hospitality. One of the Indian participants of the rally shared with everyone on the radio that her forefather’s homeland was a small town in Bangladesh that the rally would be crossing (from the outskirts) on the way to Sylhet. With deep sentiments attached, her relatives back in India had requested her to collect a handful of soil from her homeland; the Bangladeshi Team Leader informed everyone once we reached the outskirts of the town. The convoy was made to pull over to allow the participant collect a handful of soil for her to take back. And as rightly announced by the Control Car, “nothing like knowing your roots”. It was the moment after this when a senior Bangladeshi official aboard announced that the Govt. will be sending a pack of soil from the participant’s forefather’s home via a diplomatic bag once she’s reached back in Kolkata; a gesture that can’t be expressed in words. Fostering friendship, indeed. So our journey in Bangladesh comes to an end. I’d like to take this opportunity to thank Bangladesh on behalf of the entire convoy. Thank you! As I write this blog post, I’m back in my hotel in Silchar, Assam, nicely tucked-in and planning to catch some good night sleep before an 11 hour drive to Imphal tomorrow. But does that mean coming back home was uneventful? You have no idea what we witnessed today. Stay tuned for the next blog post, after today Home Coming will never be the same for us. More on it soon.. Nothing makes you feel better than getting something you've been yearning for a while, and this is what happened with us too! Day 3 of the BCIM car rally started later than usual because of the local strike, this meant none of us had to wake up at 5 in the morning. When the control car (car #1) made the announcement on the radio that we'll be leaving later in the day as opposed to early morning, the sheer joy on everyone's face was a sight! About 3.30 in the afternoon, the convoy had started lining up outside the hotel after a much needed long night sleep and a great meal. 20 minutes in, the radio announced: "Alright guys, convoy's rolling" and we set out towards the 3rd destination on our epic 3000 km road trip, to Sylhet in Bangladesh. Sylhet is about 230 Kms from Dhaka in the north eastern region of Bangladesh, and is situated near the Sheola border - India. The City is located on the northern bank of the Surma River and is surrounded by the Jaintia, Khasi and Tripura hills. The Dhaka Police yet again gave us a pilot and made sure the convoy rolls out smoothly from the city, and 60 minutess in, we had already crossed the Dhaka border. On our way out, we crossed the Secretariat, University and many major spots in Dhaka. The first quick stop came in when we discovered the local district administration dignitaries and officials of Narshindi had planned a welcome reception. We all love surprises now, don't we? ... And the convoy continued..
After 100 Kms of drive, we came to a scheduled halt for a tea break in Brahmanbaria , where we were received by the Army's Bagpiper band. The fatigue levels dropped. Some caffeine and sandwiches were all we needed to get us rolling. By the time it was tea break, the sun had already set and we were driving in pitch dark. It was quite a sight seeing 20 cars with their hazard and head lights on, moving in a straight line. Tomorrow our journey in Bangladesh will come to an end. Let me take this opportunity to thank Bangladesh, on behalf of the entire BCIM Car Rally team, for a very warm hospitality. You made us feel at home. As I write this blog post, we are bout 70 Kms away from Sylhet. As per programme, a cultural reception awaits us at the hotel. We're positive that will take our fatigue completely away. More on this in tomorrow's blog. Day 2 of the BCIM Car Rally started at 7:30am and our destination for the day was Dhaka which was 230km away from Jesoore. Dhaka is the both the capital and largest city of Bangladesh. Geographically speaking, it is located in the center of the country and is served by the port of Narayanganj. It is a city that is rich in history and culture and it is known internationally as 'the City of Mosques and Muslin'. No trip to Bangladesh is complete without first visiting Dhaka. En route Dhaka we had to cross the river Padma via Ferry. The Padma river is the main distributary of the Ganges and it enters Bangladesh from India near Chapai Nababganj. This was the only Ferry ride of the entire trip from Kolkata to Kunming, which made it all the more special and exciting. Throughout our travel the warmth and humanity in the people was very clear from the way school kids lined up on the road holding the flag of Bangladesh and people from villages came up to us with snacks and handing out flowers. Bangladesh definitely feels like home. The first stop for the day was the National Martyrs Memorial at 1:30pm. Although it was a long drive and everyone was tired, the beauty of the memorial enamored us. The monument is composed of 7 isosceles triangular pyramid shaped structures, with the middle one being the tallest. All the 4 country leaders namely Mr. Cheng Yunchuan, Mr. Mohammad Delwar Hossain, Mr. Sunil Misra and Mr. Ne Win paid their tributes at the memorial. This was followed by a delicious lunch and 33km of travel towards Dhaka. Heavy traffic welcomed us as we entered Dhaka but the police were cooperative and kind enough to guide us through the busy streets towards the Banganandhu Sheikh Mujibur Rahman Memorial Museum. This is the house of the Father of the Nation of Bangladesh, Bangabandhu Sheikh Mujibur Rahman. We were also made to cross the National Parliament Premises. The architecture of the monument was breathe taking. Our last stop for the day was the Bangabandhu International Conference Center, where the Minister of Communications welcomed us. The warm welcome was followed by a cultural show where poems of Rabindranath Tagore were recited. The team leader of the Indian team, Mr. Sunil Misra beautifully highlighted the fact on how the BCIM Car Rally is all about fostering friendship among the BCIM nations as the participants of the rally were already singing songs and sharing jokes in less than 2 days. We then left for the hotel where the Minister had hosted a lovely dinner along with some nice music by the pool side. The BCIM Car Rally participants would like to thank the Hon'ble Minister for being such a welcoming host.